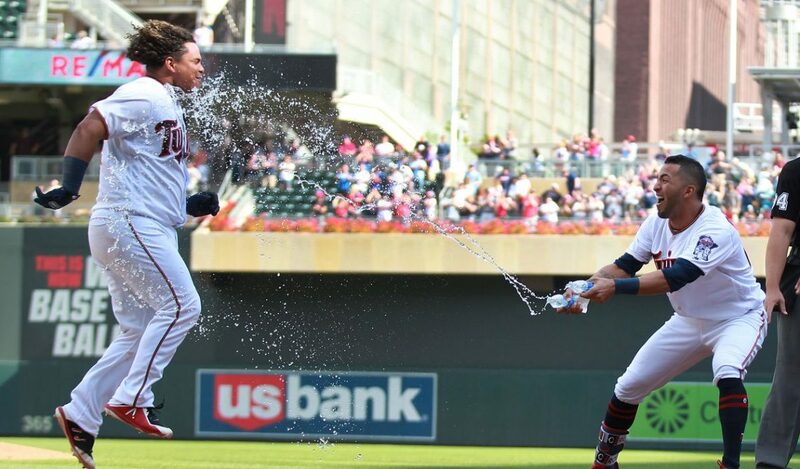 The Twins beat the Kansas City Royals in a 5-4 extra inning nail biter. Yes it’s just the fourth game of the year but it was still impactful so some twitter idiots would shut up. Hey by the way, La Tortuga scored the winning run! The Twins were not nearly as sharp as in the Indians series, starting the game by going down quickly, then Berrios had his first two pitches smacked to give the Royals a 1-0 lead. Scoring from first on a single to left? Later in the game, Nelson Cruz came through with a 2 RBI double off of a 108.3 MPH exit velocity smash to right field. Berrios and Rogers would give up a couple more and the Twins went into the 9th down by one. Polanco started with a double, followed by another Nelson Cruz RBI. Blake Parker came in for the save and got it with a nasty looking splitter that was much better than his first appearance. Notes: Byron Buxton crashes into the wall on an inside the park home run from Adalberto Mondesi. He was removed from the game and awaiting further updates. Check my Twitter @MnTwinsTalk18 for updates. Jose Berrios wasn’t quite as sharp, but was still good enough. He only had 7 swinging strikes compared to the 17 he has on opening day. His fastball velocity average also dropped from 93.8 to 92.2 so that could’ve had something to dow him having only 1 swinging strike on the fastball. He still did well for his first start on the road. Eddie Rosario got his first hit of the season today and it was a big one. He tied the game in the 9th and let the bat flip go as he went to first base. Pimp everything. Player of the game! Remember to follow my Twitter so you can vote on these daily. New Twins star Nelson Cruz is winning over the fan base quickly. He was voted POTG again and will keep winning these. Astudillo got votes for just turtle and stuff.